The Laser Dazzler is a weapon designed to temporarily blind people. The Canadian Forces want to buy them to reduce the number of innocent Afghans killed when they fail to heed warnings when approaching military convoys. The Pentagon has acknowledged that its troops in Iraq are already using these devices. China has also equipped some of its security forces for riot control. 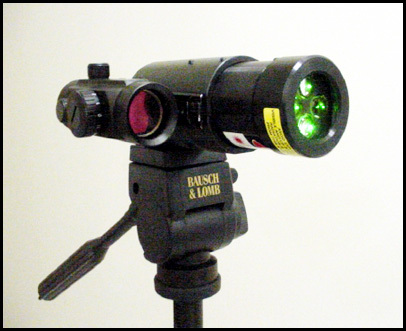 The laser systems are considered non-lethal weapons by [Canadian] Defense officials, although some in the military prefer to refer to them as warning devices as opposed to weapons. Being hit by a dazzler is akin to looking directly into the sun. Other systems on the market make use of a light emitting diode, or LED, to project an intense beam to disorient an individual. The Canadians need to be careful about their choices. Laser weapons that could blind were banned under a 1995 UN convention - the Protocol on Blinding Laser Weapons. Via Forces may arm soldiers with laser weapons.